Dr. Konstantin is 2017 Castle Connolly top doctor! 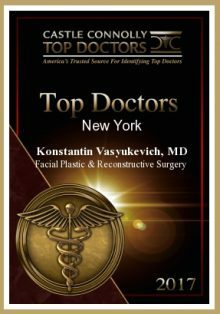 Congratulations to Dr. Konstantin for achieving the most prestigious Top Doctor Award! For the third year in a row Dr. Konstantin is recognized as one of the top Facial Plastic Surgeons in the nation. We are extremely proud of this accomplishment and would like to thank our entire team for their assistance in making this possible.